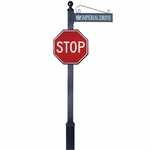 For over 20 years, Imperial Mailbox Systems has been at the forefront of the mailbox and street sign industry. 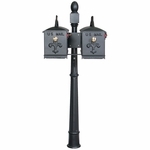 As the leading mailbox manufacturer, Imperial was invited to co-author the USPS Std 7b, standardizing the manufacturing of all residential mailbox systems. 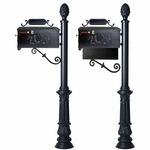 Imperial offers complete home mailbox systems that include a wide array of address plaques and security options from which to choose. Imperial continues its thrust for excellence and remains faithful to its mission to beautify America's curb appeal. BudgetMailboxes.com proudly offers the widest selection of Imperial mailbox systems, mailbox posts, address plaques, security inserts, stand-alone number plates, lamp posts, and replacement parts. 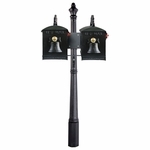 For over 20 years, Imperial Mailbox Systems has been at the forefront of the mailbox and street sign industry. 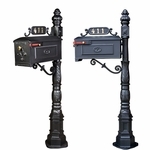 The brand offers complete home mailbox systems that include a wide array of options to create a unique design for your home. As a company, they aim for excellence and remain faithful to their mission to beautify America. 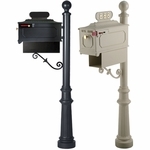 BudgetMailboxes.com proudly offers the widest selection of mailbox systems, mailbox posts, address plaques, security inserts, stand-alone number plates, lamp posts, and replacement parts. 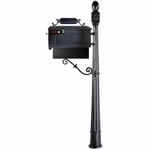 Imperial Mailbox systems are constructed using sand cast solid aluminum with stainless steel hardware to provide a unit that can withstand years of outdoor exposure. The Primary System is designed from the ground up, literally. 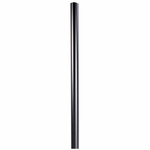 You may choose from 2 diameters and 3 height options for your post. You then can select from 8 bases and 7 finials to create a personalized foundation for your mailbox system. 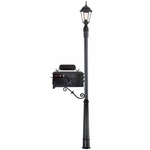 You can even customize a taller post for lamps or street signs to match your mailbox system. 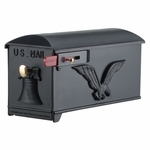 The heart of the Imperial line is, of course, its classically styled, highly durable mailboxes. 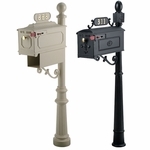 We offer all of their mailbox designs in 7 eye-catching colors for you to create your ideal look. 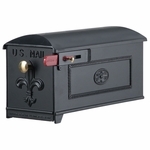 Of course, no mailbox system is complete without the perfect address plaque or a matching newspaper receptacle. 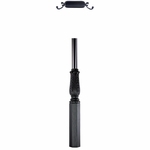 Fortunately, both of those items can be selected when completing your design. Do you need multiple boxes for one delivery location? Don’t worry, we can help. 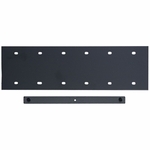 We offer mounting brackets that allow for up to 6 boxes to be mounted side by side. 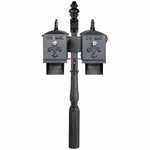 Coupled with an optional locking insert for the box’s interior, this creates a viable solution for a rural development looking to provide a secure mail drop location that is more visually appealing than the conventional grey cluster box. You can even find an adapter to mount an exterior lamp of your choosing to the top of your mailbox posts, making it easier and safer to retrieve your deliveries after sunset. 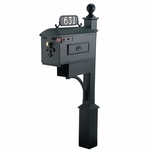 Please take a few minutes to browse the virtually endless design possibilities of the Imperial Mailbox system. Question: I'm looking for an Imperial Estate Mailbox Door. Is it available? Answer: Yes, please view our Estate Mailbox Door 0 or our Estate Mailbox Door 1, 4, 6, (Choose One). Thank you. 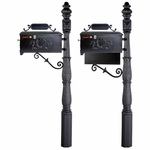 Question: How can you tell whether the kind of mailbox you have is an imperial or a Barcelona? Answer: The box should be marked on the underside of the box. The Barcelona is just a name for the design. 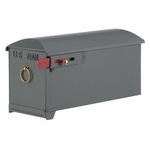 It is manufactured by many mailbox makers. 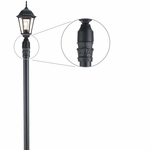 Dimensions are usually the best way to identify these because they vary with each manufacturer. 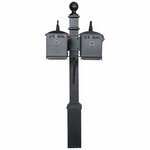 Question: I need to order an imperial mailbox post only. Does it come with any installation hardware? 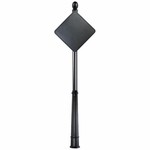 Answer: The post is a direct burial and does not require assembly, so no hardware is included. 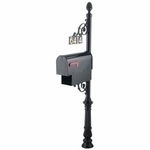 The support bracket for attaching a mailbox is sold separately and would include attachment hardware. Question: Do all the doors for the mailboxes have the same size? 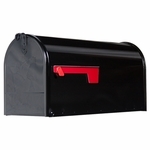 Answer: No all mailbox doors are not of the same size. 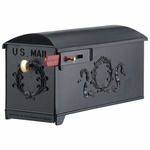 Imperial offers two sizes, a standard and an estate mailbox. 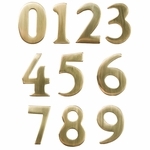 Question: We need brass numbers for mailbox adhesive. We are located in Craft Farms in Gulf Shores, AL. 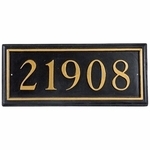 Answer: We carry the Imperial 2" Brass Numbers. However, these do not have adhesive in the back. They require a contractor grade adhesive for installation. Question: Is there any way to order just the front brass knobs? Answer: Yes, please view the Brass Door Knob for more details. Thank you. Question: Can I get a couple of replacement screws for the ones that hold the door to the bottom of the body. Two of them have fallen away lost. Answer: We don't sell the screws by themselves, however Imperial - the manufacturer of the mailboxes might send you a couple. If not, check with a local hardware store. 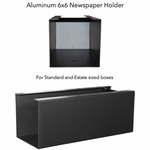 Question: I wish to purchase a C2-3005 as well as a square paper box (to fit under the postal box). Can you refer me to a dealer near Savannah Georgia or do you sell that model directly? 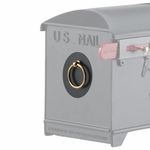 Answer: If you go to https://www.budgetmailboxes.com/imperial-mailboxes-imperial-series-mailbox.html you can build your Imperial system the way you want. Just select which items you want to use. 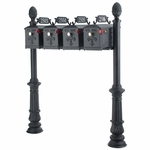 Question: Does mailbox address plate #4 have to be installed on the top of post 1? I would like in on the bottom of the mailbox. Answer: Given the design of the post for this C1/D1 Series Mailbox, it is not recommended that the address plate go beneath the mailbox. 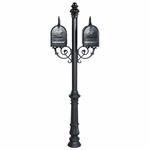 See this Instruction Manual for more details on post design and installation. 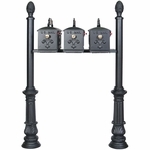 However the Newport Mailbox Post may fit your needs. Also see our selection of Streetscape Inc Mailbox Posts. Thanks. Question: I have a Modern Fleur De Lis Cast Aluminum Mailbox that requires a new hinge. Do you have these in stock? 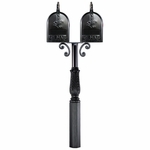 Question: I am looking for a Large Estate Imperial Mailbox hinge replacement. 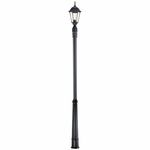 The original was about 8 inches long with 4 screws, each about 2 inches apart. 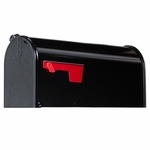 Answer: Please click the link to view the Replacement Hinge for Estate Mailbox. Thank you. 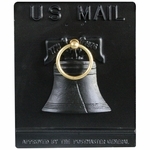 Question: Does your newspaper holder that attaches to the mailbox include the supporting brass? Answer: Not sure what you mean by supporting brass. 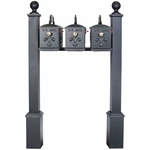 The support bracket comes with the mailboxes. 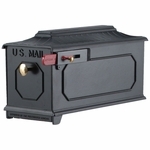 Question: How much is a 510k6 mailbox? 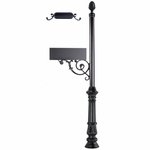 Answer: The standard price for our Imperial System is $365.00 with Free Shipping. 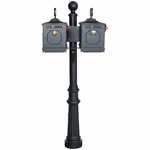 You can find our complete Imperial System via the following link: https://www.budgetmailboxes.com/imperial-mailboxes-imperial-series-mailbox.html. Question: Do sell a lockable security insert? Our association boxes are a few years old and some people want a locking feature. Our boxes have a 7.25" opening. 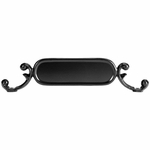 Answer: Yes, we do sell locking inserts. Please search "locking insert" on our website. Question: Can we order just a box? We already have a pole and everything else, but the box was hit by a passing car. 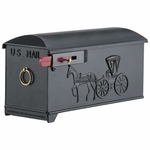 Answer: Yes, please click the link to find the full selection of Imperial Mailbox Only. Thank you.